Atlas Farm is located in South Deerfield, MA. Atlas is one of our primary suppliers! We work with them year round to bring you organic local vegetables of all kinds. Like many of our Massachusetts growers, Atlas is based in the Pioneer Valley, and we often receive produce from many neighboring farms (like Enterprise Farm) on the Atlas truck. Notably, many of our produce suppliers send fruit and veggies to us in cardboard boxes. Atlas solely uses durable, reusable plastic bins to send their produce to us, which we send back when we're done with them. Atlas's waste footprint is significantly reduced by their use of these plastic totes! Atlas also heats their greenhouses (where produce like their baby greens comes from in the cold months, and where seeds get started) with shelled corn, a locally grown and carbon-neutral heat source. 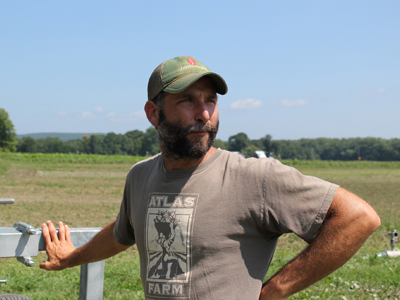 Check out our short documentary video, which includes Gideon from Atlas Farm!